You know we love it when family gets crafty together. 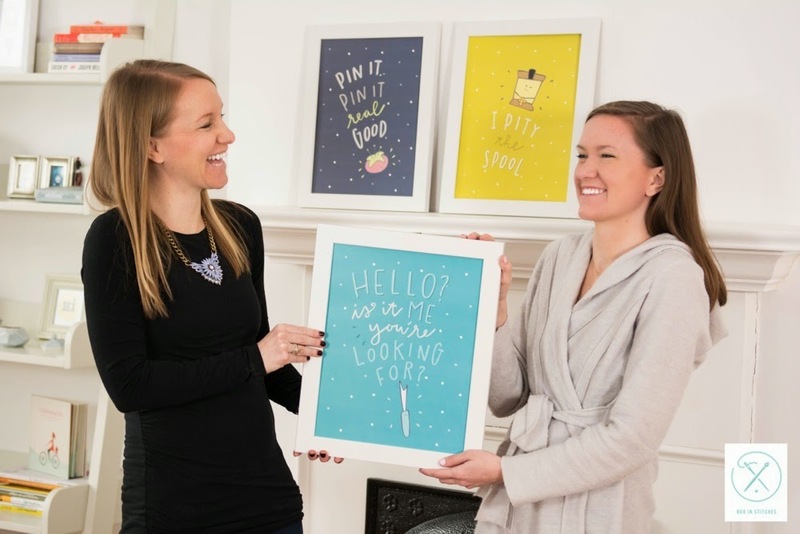 You can probably imagine how excited we are to hear that our friend Shannon of Little Luvins combined forces with her graphic designer sister, Colleen of Pinwheel Print Shop, to bring us Boo In Stitches. "What is Boo In Stitches?" you ask. Well, in their words it is a collaboration between ink and thread. 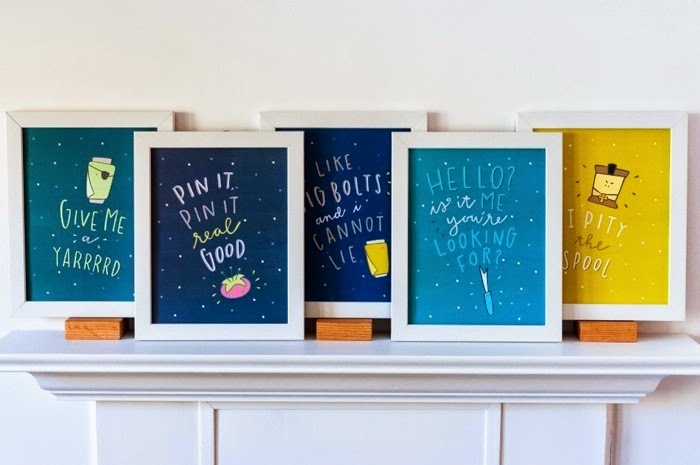 In ours, it is an awesome new company that sells funny sewing related art prints that are hand drawn and hand lettered by Colleen. They even have some fabricy pirate humour for those of you who, like us, are into that sort of thing. I know you must be thinking that your sewing room needs at least one of these gorgeous prints. Well fret not, we've got you covered. The Boo In Stitches team has graciously offered to send one of their beautiful 8" x 10" print to one of our readers. To enter all you need to do is leave a comment telling us which print is your favourite. The contest will stay open until 11:59 pm MST on February 2, 2015. The winner will be announced on our blog on February 3, 2015. If you are a no-reply blogger, a wordpress blogger, or do not have a blogger account - please leave your email in your comment so we can contact you if you win! Want to increase your chances of winning? 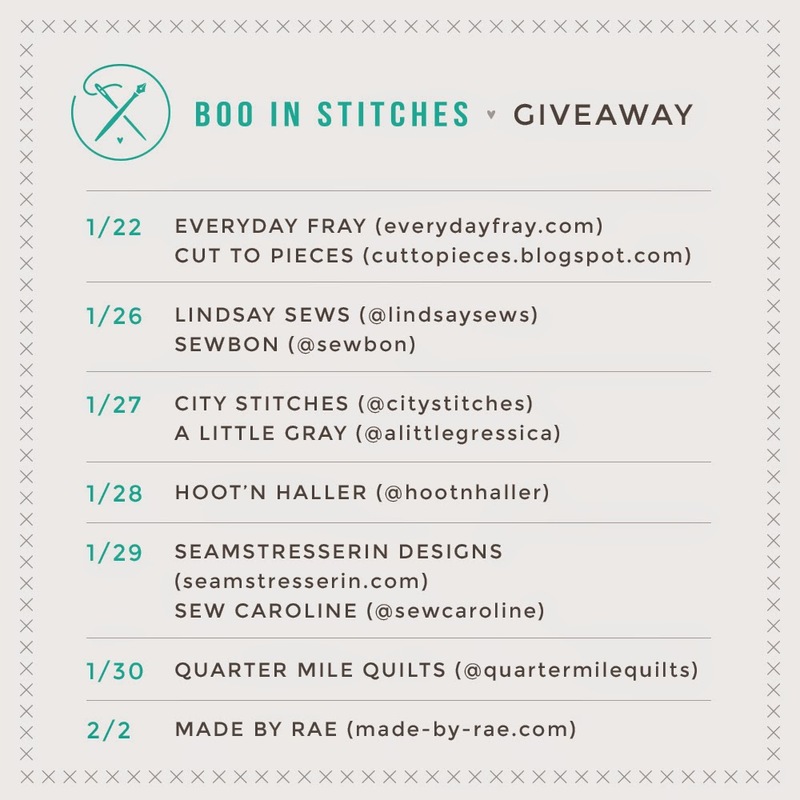 Visit some of the other blogs and Instagram accounts hosting the Boo In Stitches launch party to enter again! It's so hard to pick a favorite, they are all fantastic. But if I had to choose just one I think I would pick the "I pity the spool". I love the 'Pin It' print! I love all these prints so very much but I like big bolts is probably the favorite. I feel like it takes a special kind of person to "get" my sense of humor and when it's niche humor that's specific for crafting, quilting and sewing I have a very warm spot in my heart for it! I just love the seam ripper!
" I pity the Spool" made me laugh, so that would be the one. Thanks. Love the seam ripper. Thanks for a great giveaway. Be interested in receiving the print with seam ripper. Thanks. I like the pirate one best. They are all great! Thanks for the chance to win! i hope you offer t-shirts too! I pity the spool gets my vote for the funniest. I love "Hello,,Is it me you're looking for?" Suits my sewing room! Thanks for the chance to win. Love all of them, but the seam ripper one has to be my favorite! I LOVE the "Hello, is it me you're looking for?" Hello, is it me you're looking for? What a wonderful slogan to have in my craft room. So appropriate. I love the seam ripper! I LOVE these prints, especially the seam ripper one! So adorable! Love them all and it is toss up, but I think "Hello, is it me you're looking for?" is the catchiest! Oh, so hard to choose! I'm gonna have to go with the "I like big bolts" cause how can you go wrong! "Is it me you are looking for?" Too, too funny! That print could apply to lots of my possessions. These are awesome!! Love the seam ripper print!! Hello, are you looking for me print (seam ripper) I would totally had a pocket to it and store my seam ripper next to the print. I love all these prints. They are so funny! I like the Is it me you're looking for print, and i love the colour of I pity the spool. 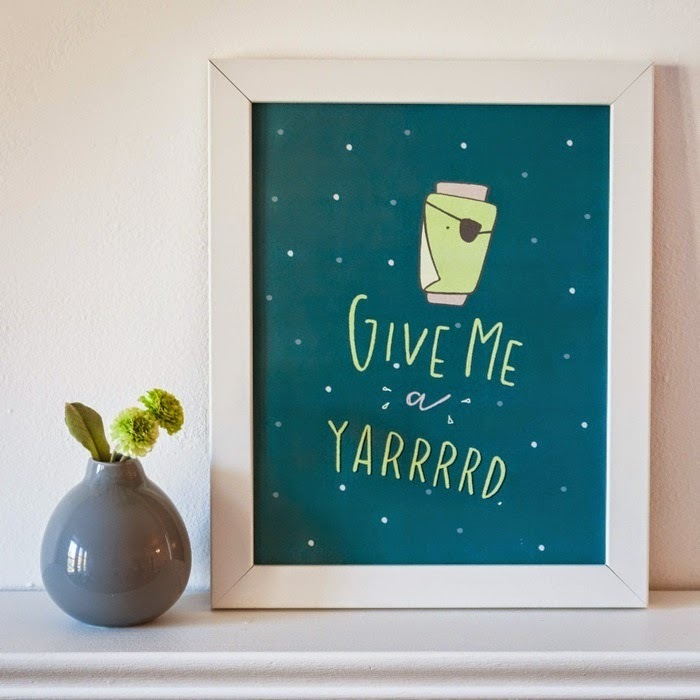 I love the give me a yaaard print. These would be AWESOME on t-shirts! I love these prints! So cute! "I pity the spool" is definitely my favorite. Thanks for the giveaway! I love the Lionel Ritchie/Seam Ripper one! It is beyond cute. I like the big bolts....very cute! I love Hello is it me you're looking for? I am always ribbing out seams. My seam ripper is my "friend!" Hard to pick just one "Hello, is it me you're looking for?" and " I like big bolts" are my favorites. this is great! but now I can't get Lionel Ritchie outta my head! It's a close call between "I pity the spool" and "Hello, is it me you're looking for?" But as someone who was a teenager in the 80s, I have to go for the latter. These are so fun! 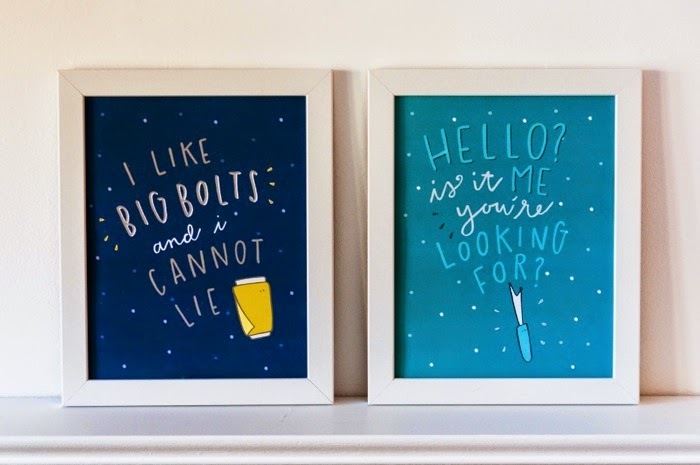 I love the Big Bolts print!! These are all so funny! I would have to pick the seam ripper one. It happens to me all the time!